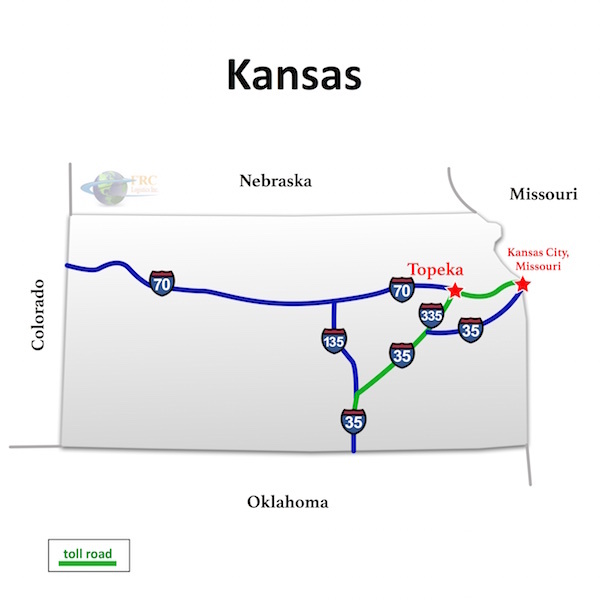 Kansas to South Carolina Freight shipping and trucking services are in high demand; Kansas City to Columbia is a very heavily traveled route. The Kansas City, KS to Columbia, SC shipping lane is a 996 mile haul that takes more than 14 hours of driving to complete. Shipping from Kansas to South Carolina ranges from a minimum of 894 miles and 13 hours from Overland Park, KS to Landrum, SC, to over 1,593 miles and a minimum of 24 hours on the road from Coolidge, KS to Little River, SC. The shortest route from Kansas to South Carolina is along the I-70 E corridor; however, there’s also a more northerly route that uses the I-64 E, passing through Lexington, KY instead of Benton, IL. Kansas’ reputation as America’s heartland is well deserved. Equidistant from both the Pacific and Atlantic Coasts. The geographic center of the 48 contiguous United States is located in Smith County, Kansas, near the city of Lebanon. Home to legendary Old West cow town Dodge City and part of the historic Santa Fe Trail, Kansas is bordered by Nebraska, Oklahoma, Colorado and Missouri and shares with Missouri its most populous area—the Kansas part of Kansas City, which straddles the state line. The manufacturing sector is responsible for much of Kansas’ industry, with the aerospace industry making up the majority of the state’s manufacturing jobs. Spirit Aero systems and Cessna are two of the best-known aerospace manufacturers in the state. Other well-known industrial names that call Kansas home include Sprint-Nextel, General Motors and Garmin. Oil and natural gas are other major industries in Kansas; the state ranks 8th in the nation for production of both resources. The heart of the Old South, South Carolina is amazingly diverse for a state that ranks 40th in size in the US. The Blue Ridge Mountains delineate South Carolina’s northwest boundaries with North Carolina and Georgia. The Piedmont region is rolling hills, the aptly named Sand hills region is in the central part of the state, and the Outer and Inner Coastal Plains sweep to the Atlantic Ocean. South Carolina’s state capital, Columbia, is its largest city, with coastal Charleston coming in second. South Carolina’s diversity extends to the state’s climate. Summers are uniformly hot, but its coastal areas have mild winters, while the inland and upland areas of South Carolina see cooler winters with freezing rain and occasional snow. Freezing rain can make conditions hazardous for travel in the winter; bridges in the state are often marked “bridges freeze before roadways” for this reason. Tropical storms and spring rains are also common, although the state sees less hurricane and cyclone conditions than nearby North Carolina. 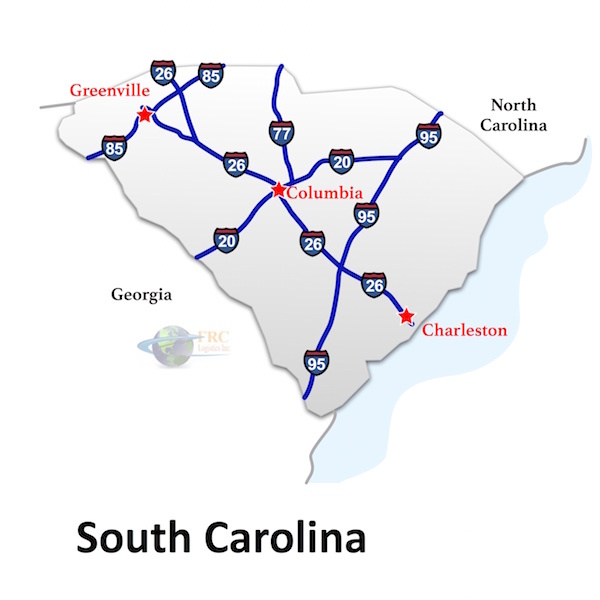 Kansas to South Carolina Freight shipping quotes and trucking rates vary at times due to the individual states industry needs. Since Kansas and South Carolina are largely agricultural, with many food processing and distribution centers, we see plenty of shipments by refrigerated trailer, flatbed as well as by the more common dry van trucks. Our Less Than Truckload (LTL) carriers in both Kansas and South Carolina are also running a number of regular services between the two states, and it’s an active route for heavy haul freight shipments, as well.